Krakow Post: Let’s start with the first thought that comes to mind – are there any physical condition requirements to be able to make it up all these stairs? KP: And… how many stairs? MK: [Laughs] We here in the tower have to climb 239 stairs every shift to a height of 54 metres, where our platform is. To give you a better idea, it’s like climbing to the 18th floor of a normal building. KP: I understand you’re not the first generation hejnalista in your family to play here. MK: I’m the third generation in my family. So my grandfather and father played here before me. Our main aspiration is to say that our family has held this seat for a span of 100 years. KP: Can you tell us what you know of the history of the hejnalisty in your family? How did it all start? MK: I never met my grandfather personally, so I’m not sure… I just know the city was looking for trumpeters and my grandfather responded. Then my dad somehow ended up here, and then somehow, so did I. So there isn’t much of a story to it, or a calling. We try to just take this position now, from the point of view that our family’s history has taken root here. KP: And future generations of your family… do you imagine them playing here in the tower? MK: As for now, I don’t have a replacement yet. I hope for one someday, but as to whether he would want to play here… There won’t be any pressure from my side, so if he’ll want to come and play, he’ll just come take my place. KP: You said you just ended up here… were there any aspirations or dreams as a child to have this job? MK: All of us as kids, as young boys, probably at one time or another dream about becoming a firefighter. But for a young person coming to work here, the work is somewhat monotonous. I, for example, was about 21 when I came to work here [in 2005]… it’s a little boring at first. You have to sit here for 24 hours; it’s as if we’re living in a lighthouse for those 24 hour shifts. It was probably more about wanting to be a firefighter as a kid. But once you start coming up here and playing, eventually it just gets into your blood. KP: Let’s talk a little more about the shifts… you said 24 hours? How many days a week do you work? MK: Our shifts are 24 hours, so we work two to three times a week. We split it into three shifts, and as there are seven of us currently playing, we are typically up here two at a time. There is also no such thing as a holiday for us… the trumpet always has to sound, whether it’s a holiday or not. KP: So do you wake up every hour to play, when you spend the night here? MK: There’s a saying that a firefighter never sleeps… that’s true for us up here, too. Every now and then we’ll nod off for 15 minutes, but never sleep. We have to play every hour, plus we keep time since we also ring the church bells at every hour. Since we’re the keepers of time here, we can’t sleep while on duty. KP: What do you do in between each hour? MK: We try to stay busy while up here. Obviously, as it’s the 21st century, we have a TV and the Internet, but we’re not at work just to sit around, so from time to time we have to go around and check on what is going on in the city… look out the windows for fires or dangerous situations, so we do that. Sometimes we’ll practice playing the trumpet. We always find something to do to pass the time. KP: What is the best and worst part of this job? MK: I never thought about that before… The best part is probably that people stand outside the tower and wait for us to play, even in freezing weather or in the dead heat or the rain. It makes this job feel valued… it definitely motivates us to play. As for the worst, there isn’t really a worst part… You have to like your job, and since we like what we do, there isn’t really a worst part. I guess if anything, it would be lasting through, or playing through the night. Even with two days off to recuperate, the night here can be hard. It’s hard to play after 24 hours. KP: Any anecdotes from your time here in the tower? MK: That probably comes more with age and with the more time that one spends here. The most amusing, funny things happen during summer vacation when people come visit us. For instance, people will get to the very top here and suddenly realize they’re afraid of heights, so they’ll be grasping the rafters with every move… that’s funny. I guess they didn’t realize they’d be on the 18th floor. As firefighters, we’re ready for the fact that anything can happen here, so we’re pretty prepared for all situations, medical and the like. Maybe we’re just used to that sort of thing. But the reactions of people when they come here are funny – for example, they’ll come and see me sitting here, and think that I’m the security, so they ask when the trumpeter will arrive. They must think that we go up and down the stairs every hour to play the “Hejnał”! We’d have to be fit as a horse to make that trip 24 times a day! I tell them, “Yeah, yeah… he’ll be here on the hour”. Then when it’s time, to their shock, I get up and grab the trumpet. KP: Any times you’ve messed up or missed your cue? MK: Sure, those things happen. A 10-20 second delay is common, since it’s not just up to us (and even so, we’re just human after all), but our instruments will stop up as well. The weather will also influence how our instrument plays. A trumpet is not like a piano – you don’t just hit it – we’re the instrument, too. So mistakes happen. But it shows that there are really people here doing this job. KP: Have you ever been tempted to play something else? 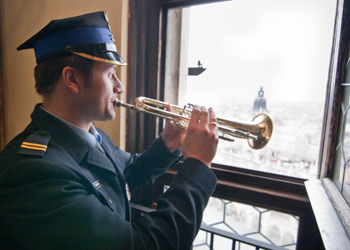 MK: We play other things too… “Piesni Maryjne” (Marian songs), we play the “Barka” for the Pope every Saturday [at 9:30 pm to mark his time of death]… but are we ever tempted to play something other than the “Hejnał” on the hour? Probably not, too many people are waiting for the “Hejnał”.